I am a hoarder of a few things: designer fabric, necklaces, and white tanks/tees. If I insist on continuing to buy these solid staples, then I have to find ways to dress them up a bit. So..along came this outfit. 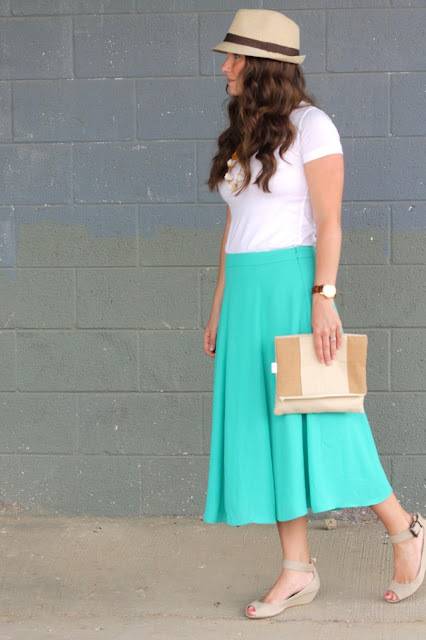 I actually wore this skirt way up high in our maternity photos and each week it falls lower and lower on my hips. It's a good and bad thing...I need to take it in a bit because this isn't the most flattering part of my waist line. But then again, I just had a baby 9 weeks ago so it's all good in this hood for now. 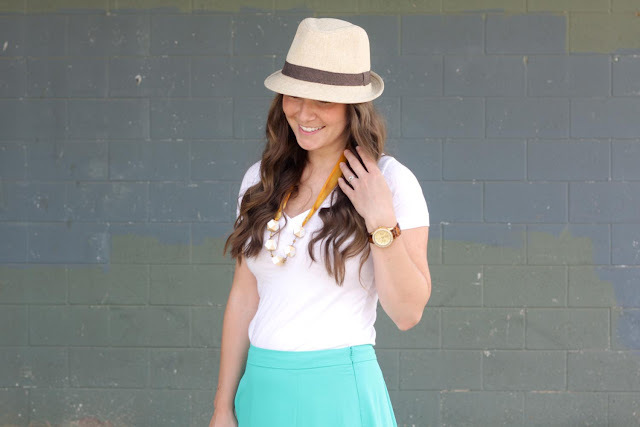 Anywho, I paired the tee with a dressier/flowy skirt, a cute little blowfish shoe, a fedora, and a colorful necklace. 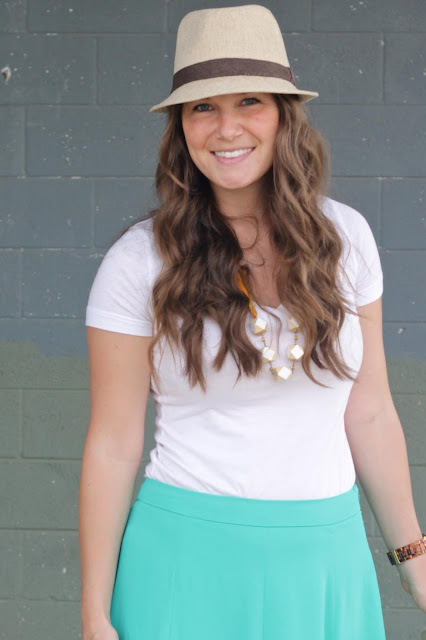 I love how the Sew Caroline clutch ties in the neutral shades of the shoes & hat. That necklace is beautiful!! and I am incredibly impressed... you look gorgeous! No way its only been 9 weeks since your little one was born! Love this outfit! I'm a big fan of a plain white tee. And that skirt is yummilicious. Baby nine weeks ago? Girl, you look GOOD. Oh that necklace! Also, you look amazing! Love this post! I hoard earrings, scarves and white tanks. When we visit my in-laws, we always make a stop at the Gap outlet where I at least buy 4 or 5 white tees and tanks (I'm a major coffee spiller, so I need back ups!). Very pretty! I hoard navy blue and white tops (t's of various forms, peasant blouses, sweatery tops, etc). I'm trying to decide if it's good or bad, because on the one hand, I feel like I'm being boring, but on the other hand, they go with just about everything and let's face it, they actually get worn (unlike the colorful tops). You look fabulous! A white tee is a must have - looks great with everything! I love the way you dressed up your t-shirt! You look amazing and I'm in love with your skirt! I think I need those wedges! Darling look, perfect for summer! So cute! 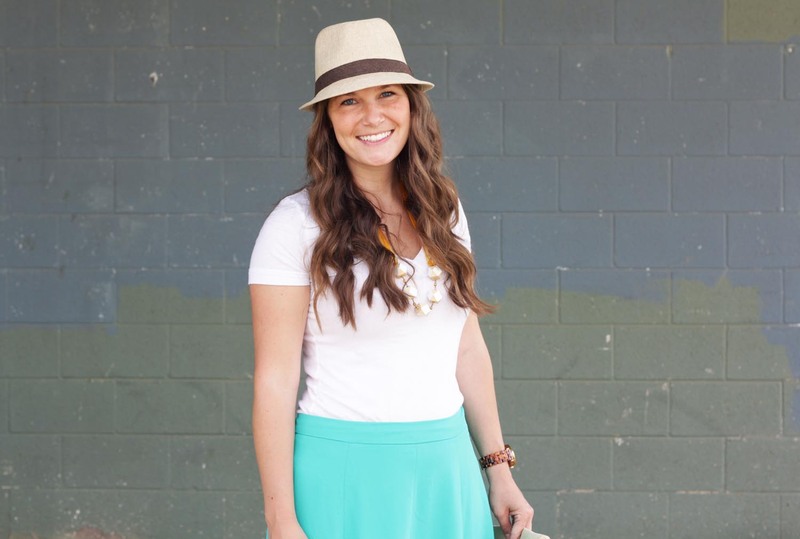 Loving your skirt and your wedges. New follower from the pleated poppy! Cute outfit! 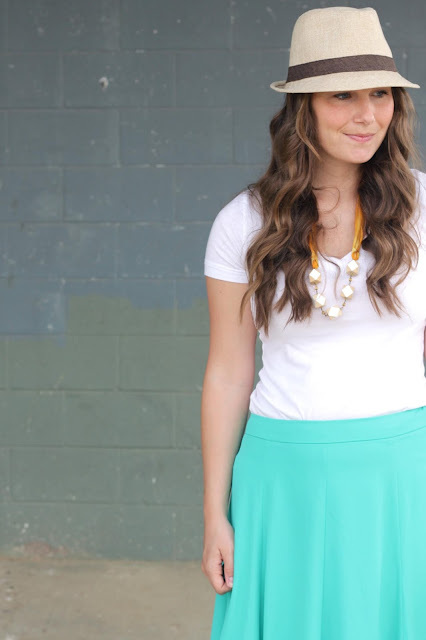 Love the color of the skirt! Very cute! That skirt is a great color and length. I love everything about this outfit. The skirt is fab... and you had a baby!? You look great. you look so hip, fun, fresh and adorable! I so do not have a hat head so I'm jealous. Great job! Such a pretty look! Love the color of that skirt and those shoes are too cute! This is precious! I am in love with the colors! Love every inch of this. Legit fashion sense sister. Have you ever thought about writing a post on breastfeeding fashion? This outfit is totally adorable. I love seeing how different women style a white tee! Beautiful outfit! The skirt is so pretty!Love every inch of this. Legit fashion sense sister.